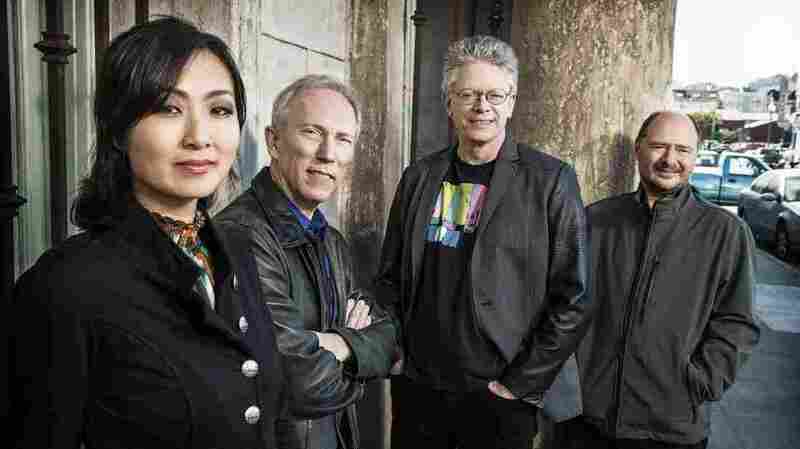 Kronos Quartet Wants To Give You Free Music — And Teach You How To Play It : Deceptive Cadence The Quartet's Fifty for the Future project will commission 50 pieces by as many composers. Then the scores and instructional videos will be free online. Irish composer and violist Garth Knox recently wrote a piece called Satellites, which, he says, tries to express sounds he imagines coming from outer space. At a Carnegie Hall rehearsal studio, he explains how to play the piece to four 20-something musicians from San Francisco who call themselves the Friction Quartet. Knox says that to create these extraterrestrial sounds, he used an unconventional approach. "The small techniques that are overlooked in classical music," he says, "and the little bow noises you can make by doing things not quite as your teacher showed you — but what you do when he's not looking. You can find amazing things. Bows and strings can work in many different ways." Four days after the workshop, the Friction Quartet performed Knox's Satellites in a concert at Carnegie's Zankel Hall. It's all part of a project by the Kronos Quartet called Fifty for the Future. The group is commissioning 50 works from as many composers. It will premiere each piece, and then hold workshops with the composer and young musicians. Then the score will be posted on the Kronos website, free for anyone to download, along with performance and instructional videos. Knox was paid for the commission, but the 59-year-old says he doesn't mind giving away the copyright in return for hearing Satellites performed around the world. "I'm very happy that people play my music," he says. "It's a delight for me. I want as many people to play it as possible. There's nothing secret about what I'm doing. I'm very happy to share it. And I find this whole project very generous; a show of generosity." The 25-year-old violist in the Friction Quartet, Taija Warbelow, says the project is a boon for young musicians. "When you're starting out in chamber music, you often play Mozart or Haydn or things like this," she says, "and you don't get exposed to new classical music until much later in your career. It would have been great to have these pieces they're commissioning now when I was younger, because you learn a whole host of new techniques, and you help support the music that is being created now if you're exposed to it younger." The five-year project has a budget of $1.5 million, funded in part by Carnegie Hall. Along with Satellites, the first group of commissions includes a piece for electronics and strings; quartet music from Serbia and Mali; and composer Wu Man's Four Chinese Paintings. Wu is a virtuoso of the pipa, a pear-shaped, four-stringed instrument sometimes called the Chinese lute. And she wants to get that sound from a string quartet. "I'm not trying to imitate the bow sound," she says. "I'm hoping bowed instruments could imitate my plucking, the pipa sound — the kind of bending the note, the slide, that's on the left hand. So that brings a different language, very different from European music." Wu came to New York to show three young quartets how to play the piece after Kronos premiered it. 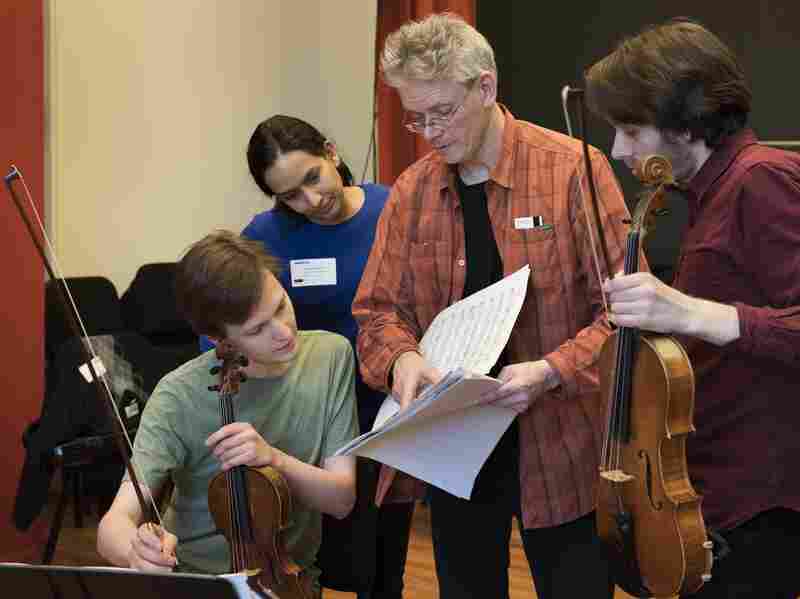 Kronos violinist David Harrington says when all 50 of the commissions are delivered, the result will be a mosaic of what is possible in string quartet music, available for anybody to learn. And Fifty for the Future has some big names on tap, including works for string quartet by Philip Glass, Laurie Anderson and Rhiannon Giddens of the Carolina Chocolate Drops. "What I hope will happen is that the art form is just going to expand," he says. "And the explorations that will be possible from this body of work will just bring a lot of new energy into the field."